Before they could vote one of the ways a woman could show her support for a political candidate was by making a quilt. There are wonderful examples of antique political quilts in museums and from November 6, 2008 to March 29, 2009 there will be a special exhibit, “Partisan Pieces: Quilts of Political and Patriotic Persuasion”, at Women's Museum in Dallas, Texas. Alyssa Gardina, a member of the museum staff, described the hanging of the quilts in this way, "Seeing these quilts (there are over a dozen) hanging in The Women's Museum is very powerful. As they went up one by one, it was like we were giving voices to even more women and telling their stories. 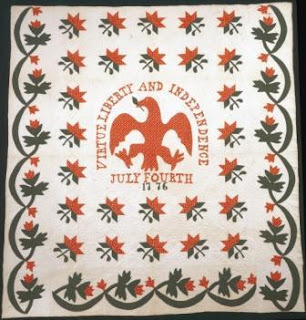 Political quilts were the voices of women before suffrage, and each of these quilts discusses politics in a different way, from the Carolina Lily commemorating the centennial to the more abstract patchwork quilts that leave greater room for interpretation." I hope you can go as it’s so much better to see the quilts than to look at pictures. But if you can’t get to Dallas you can view a brochure for the exhibit at the International Quilt Study Center and Museum site. There are some great block names that date back to the middle decades of the 1800s. Many of the classic quilts designs were developed during this time. Since the Whig party and the Democrats were the major parties during that time it’s not surprising that blocks appeared for and against the Whigs. 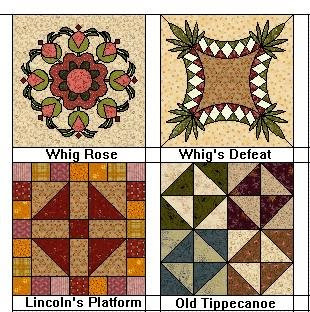 The tight race between Harrison and Van Buren in 1840 inspired quilters to name a quilt quilt block Tippecanoe. “Tippecanoe and Tyler Too” was a favorite slogan of Harrison supporters as Harrison had been a hero in the battle of Tippecanoe in 1811. Later, at the end of the Whig era Republican, Abraham Lincoln, inspired the pattern, Lincoln’s Platform. Of course there many were other political quilts made and even the blocks shown to the right have had other names. Quilt names varied quite a bit back then. Making political quilts didn’t end when women got the vote. 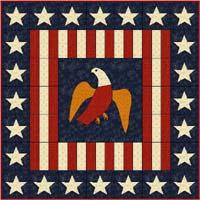 Many quilts have been made for the 2008 presidential election. In fact, the International Quilt Festival at Houston has a special exhibit, "Patchwork Politics", on political quilts this year. You can see quilts from this exhibit at Quilt Festival @ Home.